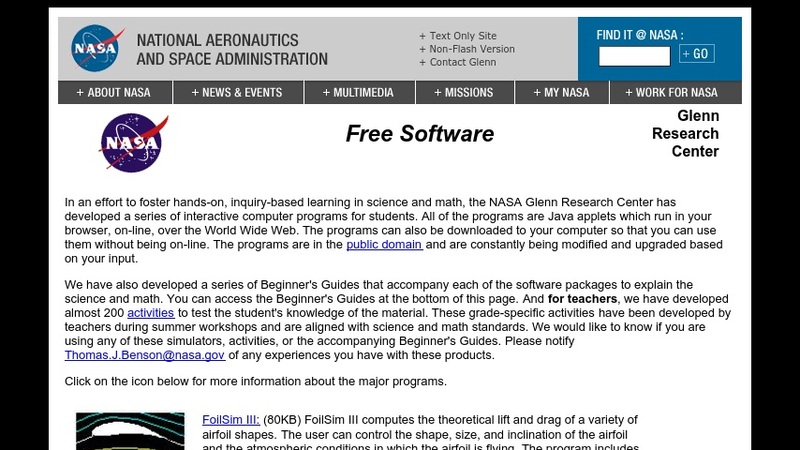 In an effort to foster hands-on, inquiry-based learning in science and math, the NASA Glenn Research Center has developed a series of interactive computer programs for students. All of the programs are Java applets which run in your browser, on-line, over the World Wide Web. We have also developed a series of Beginner's Guides that accompany each of the software packages to explain the science and math. You can access the Beginner's Guides at the bottom of this page. And for teachers, we have developed almost 200 activities to test the student's knowledge of the material. These grade-specific activities have been developed by teachers during summer workshops and are aligned with science and math standards.